IV Art Space was a pioneer in what has become San Antonio’s First Friday Art Walk. Located on Alamo St. just south of Durango, (Cesar Chavez) and across from the original and legendary Bar America, IV Art quickly became a go-to destination for art seekers to continue to gather when Blue Star Arts Complex openings would close at 9pm. 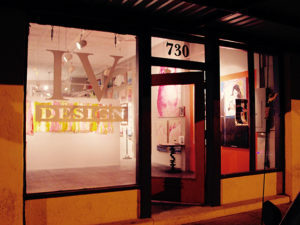 Started as an extension of IV Design house, owners Joey Hladek and Andrew Watson had extra store front space that would become home to IV Art. The first art show they hosted featured works by Hladek and Watson and drew an immediate positive response. 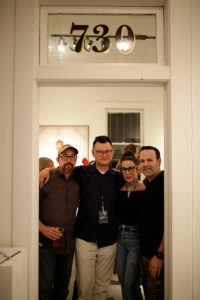 Shortly after Stefunny Price was invited to become a partner and head of IV Art Space, Price along with Frank Leal quickly built an eclectic stable of emerging, mid-career and established artists. Together the four would collaborate to push the boundaries of the typical visual art space. IV Art hosted a wide range of events including fashion shows, dance performances, poetry readings, DJ’s, live musical performances and community gatherings. Good memories of a professionaly ran space with a underground feel. A Southtown gallery jewel that shined and allowed up and coming artists a venue to experiment and showcase fun uncensored work. This retrospective seeks to recreate the collaborative spirit and vitality of IV Art Space. The exhibit will highlight works from the original IV artist stable from the period as well as new works, thus, documenting a progression from selected artists, as well as photographs, video, and written memories from featured artists about their time at IV Art Space. Exhibiting artists: Katherine Brown, Sarah Gonzales Busse, Dayna De Hoyos, Jerry Gann, Janet Hladek, J.S. Hladek IV, Myriam Lanau, Frank Leal, Marty Leal, Chris Dor Lutz, Marcy McChesney, Tim McMeans, Javier Munoz, Will Munoz, Abel Ortiz-Acosta, Glenna M. Park, Joe Pena, Gil Rocha, Sylvia L. Sanders, Geannie Sandoval, Edward Sousa, Robert Tatum, Hank Waddell, Andrew Watson.